International Series of Monographs on Analytical Chemistry, Volume 10: The Analytical Chemistry of Thorium focuses on the composition, properties, and reactions of thorium. The book first discusses the occurrence of thorium and its properties. Topics include the position of thorium in the periodic system; methods of preparation for metallic thorium; and radioactivity of thorium isotopes. The text surveys the chemical and physical methods in identifying thorium. Gravimetric and fluorescence methods; detection and estimation of thorium by spectroscopic and X-ray analysis; and colorimetric and spectrophotometric methods are discussed. The text also examines the methods of separating thorium from associated elements. The separation of thorium from rare earths, scandium, titanium, uranium, lead, alkali metals, gallium, and beryllium is underscored. The text also discusses the determination of thorium in natural and industrial materials. Regeneration of thorium from industrial waste; isolation of thorium from ores and minerals; and analysis of alloys containing thorium are explained. 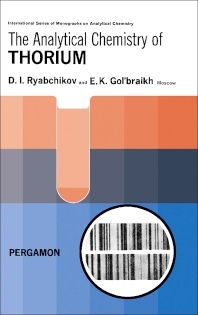 The book is a valuable source of data for students and chemists wanting to study thorium.